I was hired by a company and i am confirmed staff. the company's management shall have the discretion to alter/change your working hours as deemed necessary due to operational changes of the company, but with the above workingarrangement noted. I am wondering can he simply change ? i took this offer is because of the 4 working days, if they give me 5 working days at this price, i won't even accept this employment. I ring up IR in shah alam, the officer told me that "they have right to alter/change but not expand", means they can change and ask me to work on site Monday, Tuesday, Thursday & Friday and oncall on Wednesday. No matter how they change, it must be 4 days on site + 1 day on call. Since you have brought the issue to the IRD, you can get back to them if you could not get the matter resolved between you and the company. Thanks Siew but as you know, every IR officer give different advise. I have contacted IR officer in my hometown and he told me that i have not much ground to argue. So i am wondering in terms of contract, what is their right and what is my rights. Actually at this juncture, there is nothing much the IR officers can do. They cannot tell your employer to stop changing your working hours. 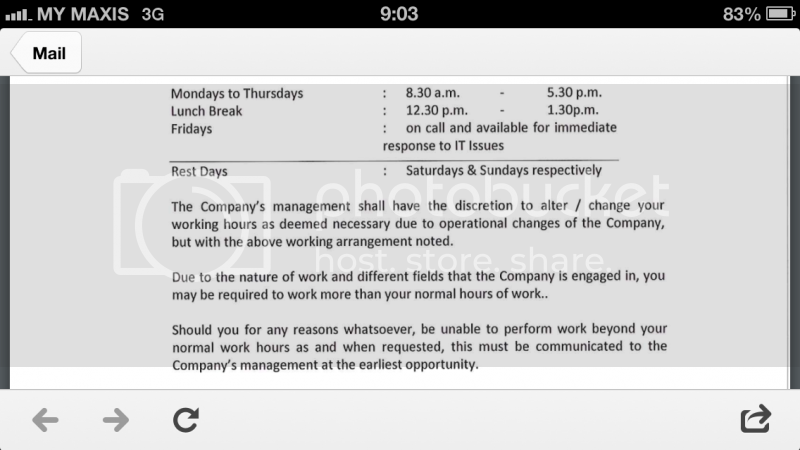 They also cannot tell that you should or should not accept the new working hours. The employer has his right and you have your right. So, the dispute can have quite unpleasant results. Use your better judgment, negotiate a bit. Tell him in order to be fair, increase in working hours he should also be an increase your salary also. Force to resign 24 hours by employer. Contract ending am i entitle for maternity leave ?!! Am I allowed to leave be4 my contract ends?